For other uses, see Dwarf (disambiguation). In Germanic mythology, a dwarf is a human-shaped entity that dwells in mountains and in the earth, and is variously associated with wisdom, smithing, mining, and crafting. Dwarfs are sometimes described as short and ugly, although some scholars have questioned whether this is a later development stemming from comical portrayals of the beings. Dwarfs continue to be depicted in modern popular culture in a variety of media. The modern English noun dwarf descends from the Old English dweorg. It has a variety of cognates in other Germanic languages, including Old Norse dvergr and Old High German twerg. According to Vladimir Orel, the English noun and its cognates ultimately descend from Proto-Germanic *đwergaz. A different etymology of dwarf traces it to Proto-Germanic *dwezgaz, with r being the product of Verner's Law. Anatoly Liberman connects the Germanic word with Modern English dizzy: allegedly, dwarfs inflicted mental diseases on humans, and in this respect did not differ from elves and several other supernatural beings. Norse mythology provides different origins for the beings, as recorded in the Poetic Edda (compiled in the 13th century from earlier traditional sources) and the Prose Edda (written by Snorri Sturluson in the 13th century). The Poetic Edda poem Völuspá details that the dwarfs were the product of the primordial blood of the being Brimir and the bones of Bláinn (generally considered to be different names for the primordial being Ymir). The Prose Edda, however, describes dwarfs as beings similar to maggots that festered in the flesh of Ymir before being gifted with reason by the gods. The Poetic Edda and Prose Edda contain over 100 dwarf names, while the Prose Edda gives the four dwarfs Norðri, Suðri, Austri and Vestri (Old Norse 'North, South, East, and West') a cosmological role: they hold up the sky. 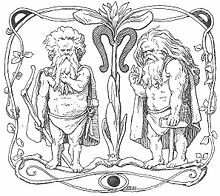 In addition, scholars have noted that the Svartálfar (Old Norse 'black elves') appear to be the same beings as dwarfs, given that both are described in the Prose Edda as the denizens of Svartálfaheimr. Very few beings explicitly identifiable as dwarfs appear in the Poetic Edda and Prose Edda, and they have quite diverse roles: murderous creators who create the mead of poetry, 'reluctant donors' of important artifacts with magical qualities, or sexual predators who lust after goddesses. They are primarily associated with metalsmithing, and also with death, as in the story of King Sveigðir in Ynglinga saga, the first segment of the Heimskringla — the doorways in the mountains that they guard may be regarded as doors between worlds. One dwarf named Alvíss claimed the hand of Thor's daughter Þrúðr in marriage, but he was kept talking until daybreak and turned to stone, much like some accounts of trolls. In Middle High German heroic poetry, most dwarfs are portrayed as having long beards, but some may have a childish appearance. In some stories, the dwarf takes on the attributes of a knight. He is most clearly separated from normal humans by his small size, in some cases only reaching up to the knees. Despite their small size, dwarfs typically have superhuman strength, either by nature or through magical means. Many dwarfs have the ability to make themselves invisible, typically via a "Tarnkappe" (cloak of invisibility), which seems to be a very old attribute of the dwarfs. They also possess other magical objects, and often appear as master smiths. Typically they live inside of hollow mountains, though in some cases they may live above the ground. Depending on the story, they may be hostile or friendly to humans. Male dwarfs are often portrayed as lusting after human women, whereas female dwarfs seek to possess the male hero in the legends. The dwarf Alberich plays an important role in the Nibelungenlied, where he guards the Nibelung's treasure and has the strength of twelve men. He is defeated by Siegfried and afterwards serves the hero. In Ortnit, Alberich seduces the queen of Lombardy, thereby begetting the hero Ortnit. The dwarf then aids Ortnit in his adventures after revealing to the hero that he is his father. In Das Lied vom Hürnen Seyfrid, Siegfried is aided by the dwarf Eugel, who is son of the dwarf king Nibelung, originator of the Nibelung's treasure. The hero Dietrich von Bern is portrayed in several adventures involving dwarfs. In Laurin, he fights against the dwarf King Laurin at the dwarf's magical rose garden and later rescues a woman whom Laurin had kidnapped. A similar plot occurs in the fragmentary poem Goldemar. In Virginal, Dietrich rescues the dwarf queen Virginal from a force of invading heathens. The dwarfs Eggerich and Baldung play a role in aiding Dietrich in the poem Sigenot: Baldung gives Dietrich a magical gem that prevents him from being bitten when thrown into a snake pit, whereas Eggerich helps Dietrich and Hildebrand escape. In the Heldenbuch-Prosa, a dwarf takes Dietrich out of this world after the death of all the other heroes, a role given to Laurin in some other versions of Dietrich's end. 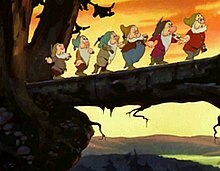 The famous sequence where the seven dwarfs sing "Heigh-Ho" in the 1937 film Snow White and the Seven Dwarfs. There were seven dwarfs in the Brothers Grimm's fairy tale Snow White. The Walt Disney Company's 1937 film based on the story, one of the first feature-length animated films, is the best known adaptation today. Most dwarfs in modern fiction closely follow those of J. R. R. Tolkien's The Lord of the Rings, where the dwarves (Tolkien's spelling) were distinguished from Elves. Most modern fantasy media have continued this distinction, beginning with TSR's Dungeons and Dragons. Dungeons and Dragons calls the dwarfs "dwarves" and the dark dwarves "duergar." They are also present in C. S. Lewis's The Chronicles Of Narnia, in both the books and the film adaptations. Dwarfs appear in many fantasy MMORPGs as a playable race. ^ a b c d Simek (2007:67–68). ^ a b Gillver, Marshall, & Weiner (2009:104-108). ^ Simek (2007:305), Orchard (1997:35), and Hafstein (2002:111). ^ Motz (1983:90–91, 105–06); Gundarsson (2007:81, 83). ^ a b c Griffiths (1996:54). ^ a b Gundarsson (2007:73). ^ Lütjens 1911, pp. 70-72. ^ Lütjens 1911, pp. 69-70. ^ Lütjens 1911, p. 74. ^ Lütjens 1911, pp. 79=80. ^ Lütjens 1911, pp. 80-86. ^ Lütjens 1911, pp. 91-92. ^ Lütjens 1911, pp. 94-98. ^ Lütjens 1911, p. 103. Lütjens, August (1911). Der Zwerg in der deutschen Heldendichtung des Mittelalters. Breslau: M. & H. Marcus. This page was last edited on 22 April 2019, at 23:21 (UTC).